We learned a few things from hiking Kepler. 1) Allen and I walk faster than the times posted on the DOC signs. 2) There is not much to do upon arrival at the huts so it is best to maximize the daylight on the trail. 3) We can complete a 4-day hike in 3 days with relative ease. 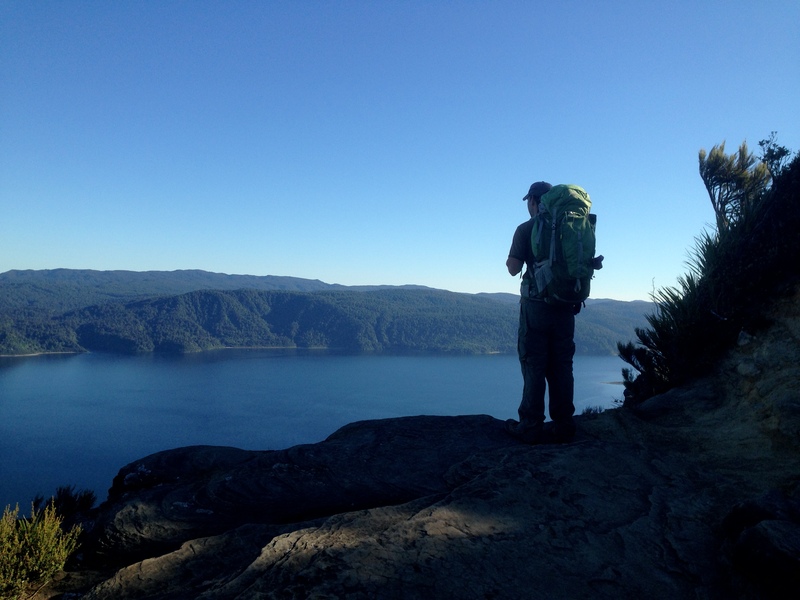 Knowing this, we planned to complete the Lake Waikaremoana 4-day hike over a 3-day weekend. Friday was a public holiday so after work on Thursday we drove to Rotorua, about halfway to the lake. Early Friday we began the 3.5 hour drive. The first hour was smooth sailing, but upon entering Te Urewera National Park the road is unsealed. The final 90km took 2 hours. We arrived at Big Bush Holiday Park in time to catch the 12:30 water taxi from Onepoto Bay to the trail head at Hopuruahine Landing. By 1:30pm I was nervous; we had not even started and had 17km to complete before dark. As we began I was surprised at the constant changes in elevation. The DOC brochure described this section as a “moderate walk with plenty of chances to relax.” Most trampers hike in the opposite direction so perhaps after the previous days’ terrain this is moderate? If so, I was in trouble. Opportunities to relax proved true. 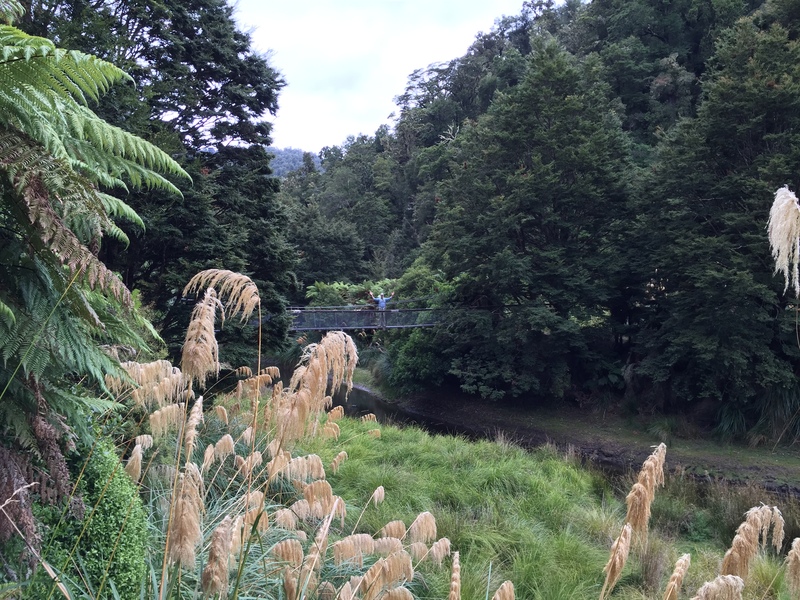 Within an hour we reached Whanganui Hut and stopped for a break. A couple hours later we approached Waiharuru. We were making good time so relaxed for 10 minutes before starting the final push to our destination. Crossing a beautiful swing bridge, Marauiti Hut came into sight! 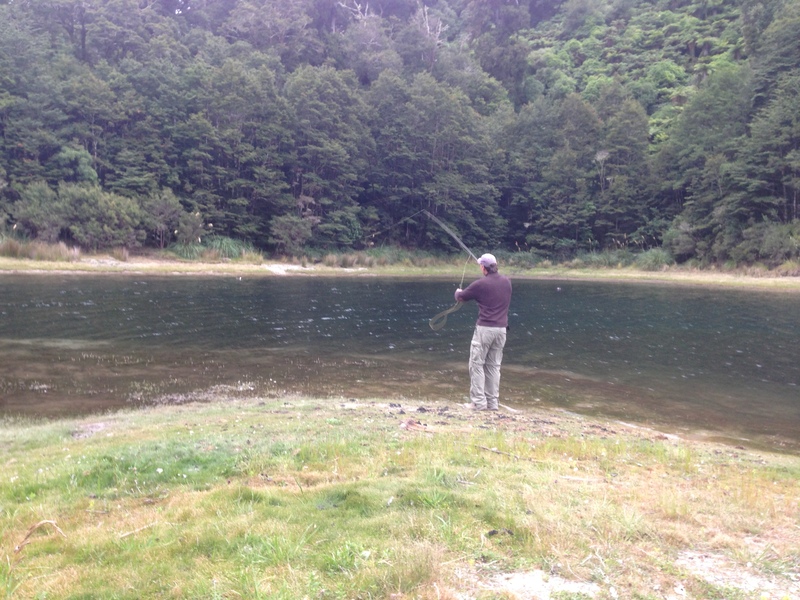 It is located where a stream meets the lake so Allen spent a few hours trout fishing. Day two was our longest, toughest day. We traversed over 24 kilometers and climbed 600 meters. The first 12km was relatively flat, skirting the lake. We exited the main trail for an hour to visit the beautiful Korokoro Falls. It was further off the track than I anticipated, but worth the detour. We reached Waioparoa Hut in the early afternoon. This is where DOC recommended we end our day, but we had combined days 2 and 3 so had a steep 8km ahead of us. Waioparoa Hut had a large grassy area along the lake so we stopped for a long lunch. Eventually we began the ascent to Panekire. Remembering that it took my knees weeks to recover from Kepler I took it slow and made frequent stops. Views of the lake gave way to valleys of beech, podocarp, and kamahi forest. So many shades of green! Panekire Hut sat at the summit of the bluff and offered magnificent views of the lake to the north and valley to the south. 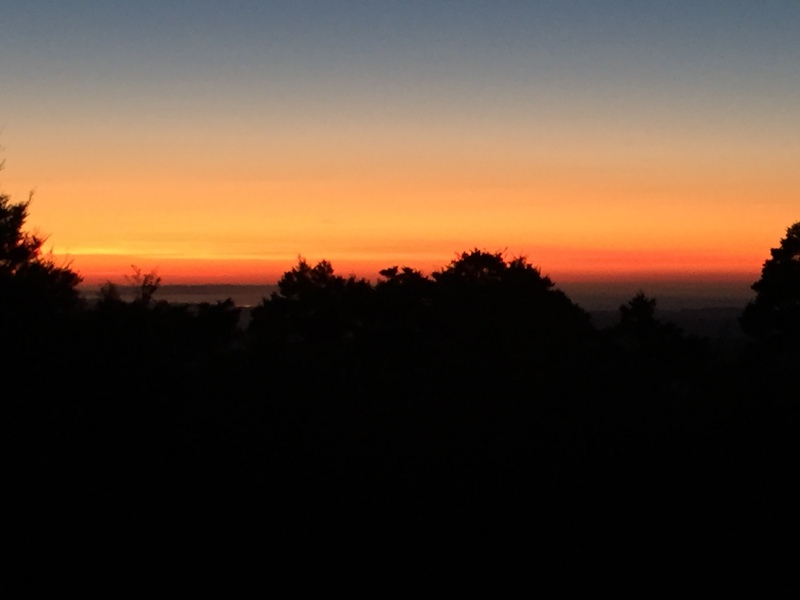 We left early on our last morning and watched the sunrise from the trail. I do not advise this as the trail is covered in tree roots so you need to carefully watch every step, but we were afraid the 9km descent would take awhile and we had scheduled a 9:30am pick-up. The best thing about this section was having the trail to ourselves. Watching the sun rise through the trees, seeing the clouds & mist fade to reveal the lake, and hearing only the sound of our footsteps and the occasional bird. 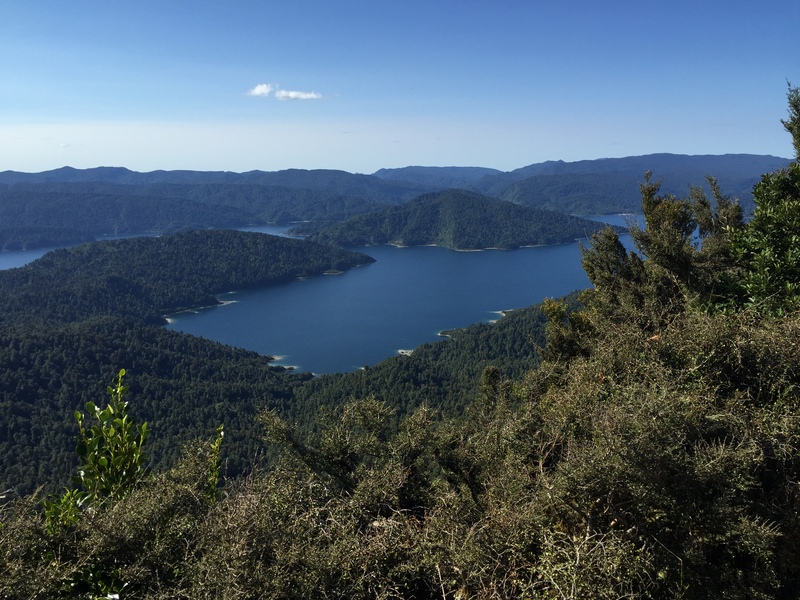 It was hard for us to gauge our progress since there were no landmarks – huts, campsites, or shelters – between Panekire and Onepoto, so we did not allow ourselves more than a few quick photo ops. We moved along as quickly as we could. After a few hours we passed a few people walking the opposite direction. Could this mean we were almost done? YES! We arrived at Onepoto Bay with time to spare. stocked up on food for the hike at Rotorua Pac N Save. Huts did not have burners so no hot food or drink. Fat Dog Cafe in Rotorua. If we had stumbled on the night market before dinner we would have eaten there. Big Bush water taxi to get across the lake to the trail head.